On-Demand manufacturing plays an integral role in the evolution of the apparel industry. While the biggest disruption will undoubtedly come from innovative software that will allow all of our systems to be seamlessly integrated, On Demand manufacturing will impact everything from samples to the customer experience, adding value every step of the way. More specifically, On Demand solves issues such as out of stock, out of inventory, out of the right size, color, hem length, sleeve length, etc. On Demand adds value to the customer, brand, and retailer by producing exactly what is needed, when it’s needed. In addition to addressing inventory challenges, On Demand has an immediate, positive effect on reducing the apparel industry’s contribution to pollution. It is said that this industry is the second worst polluter in the world. It is caused in part by producing clothing based on an unscientific forecasting model and shipping the orders half way around the world. The clothing is then warehoused or placed in distribution centers and retail stores. When the clothing doesn’t sell or is discontinued it is sent to landfills. On-Demand is a cleaner, more efficient method of manufacturing that adds value to each step of the process. OnPoint Manufacturing (OPM) specializes in Purchase Activated Mass Customization of apparel. OPM has developed technically advanced manufacturing and distribution solutions for the apparel industry. The factory model automates and integrates almost every aspect of the manufacturing process from order entry all the way to delivery directly to the customer. The integrated components that are driven by complex software allow OnPoint to manufacture millions of unique SKU's on-demand thereby reducing inventory costs and streamlining the entire supply chain. The apparel industry has been operating on Henry Ford's in-line manufacturing system that revolutionized factories in 1913 and has remained almost unchallenged since. OnPoint Manufacturing takes the best of the in-line practices and adds a new dimension of automation, computer integration, and a unique new element of On Demand customization. Encouraged by the global explosion of on-demand and mass customization in other industries, the team at OnPoint has designed an almost three-dimensional system to supplant Ford's linear line that had become too inflexible. 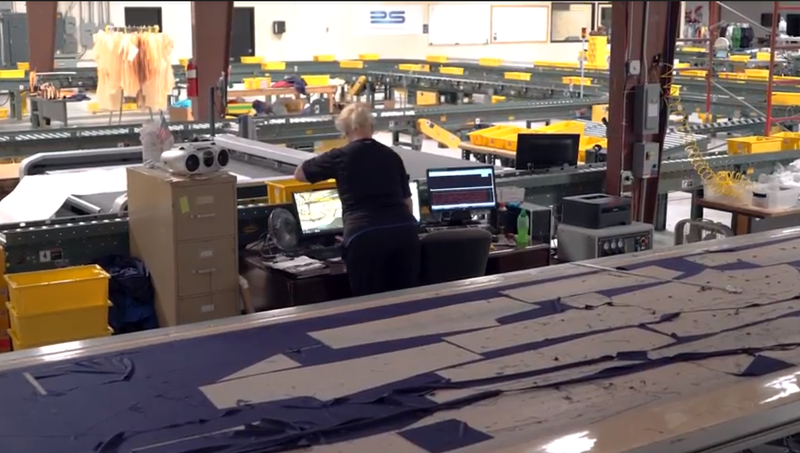 OnPoint’s factory model automates and integrates just about every piece of the process from order entry to delivery yet keeps the fine skills of the seamstresses. The new plant produces high quality garments, in any quantity, cost effectively, and quickly. The supply chain has been stretched to the limit in the apparel business. OnPoint seized an opportunity and collaborated with experts who possess boldly creative and technically brilliant minds in order to build a solution that addresses these challenges. The focus of On Demand is to add value to the customer experience and retain sales because you are not relying on what is in (or out) of stock and can deliver exactly what the customer wants. This means that you do not pay for inventory that may or may not sell. It means that you are not stuck with obsolete inventory and you do not invest in warehousing. You achieve more flexibility to modify your designs, add to your portfolio, and meet the needs of your customer. This model incorporates less risk and delivers more value, all while achieving the exact garment that you envision. Order only what you need, which greatly reduces or even eliminates your requirement for warehousing. You never have to tie up capital with unwanted inventory or spend money on shipping. Whether you require one piece or thousands, the rates are structured so that you always make money on every sale, with profitability increasing as your volume increases. Orders are typically shipped directly to your customer within 72 hours. You have the option to reduce overhead by authorizing OnPoint to function as your fulfilment house. OnPoint becomes your invisible partner in getting orders to customers. With the On-Demand model, your returns will be virtually eliminated. This will save you money as you only make what you need and when you need it. OnPoint Manufacturing is located in Florence, Alabama, and 100% of the products that we produce are American made. With OnPoint you are keeping manufacturing in the USA, closer to your market, with faster delivery times. The on-demand apparel manufacturing business model, and its benefits. OnPoint Manufacturing solution for e-commerce apparel retailers.